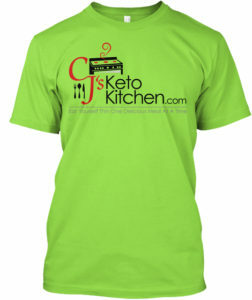 HELLO CJSKETOKITCHEN FAM! 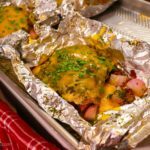 This week we bring you another delicious , easy to make and versatile Keto recipe; Keto Ranch Chicken Foil Packets. This is recipe actually goes way back to Sarah’s childhood days. 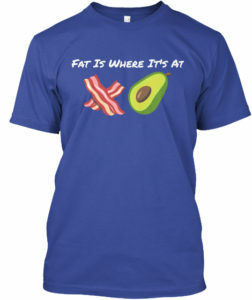 This is actually a converted recipe that we’ve made Keto. Traditionally this is made with potatoes, but because potatoes aren’t keto friendly we’ve replaced them with radishes. Yes, radishes believe it or not, radishes are a really good substitute for potatoes, they are pretty flavor neutral and take on the flavor of whatever they are cooked in after they get soft and tender. Several months after starting Keto I had a french fry and noticed that the potato actually had no taste, the taste was really associated with the salt and the oil more so than the actually potato. This recipe is very versatile and you can take it multiple ways. You could use salmon, shrimp, pork, or beef, the options you are only limited by your imagination. This dish is great for keto meal prep. We made four packets, and it really is very easy to make. 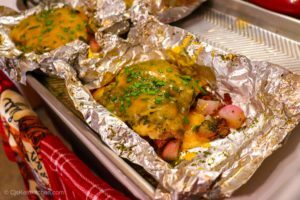 This dish could also be used on a BBQ or over a camp fire. So the Ranch Butter was something new for me. When Sarah and I were discussing the recipe I pictured that she was making a Ranch Dressing, but I was surprised when she just used the seasoning blend. We purchased our seasonings from the bulk food section at a local super market, this is a very budget friendly option and you can get just the amount that you need for specific recipes. This dish was delicious and I took the leftovers for lunch the next day. Delicious, easy to make and fun! 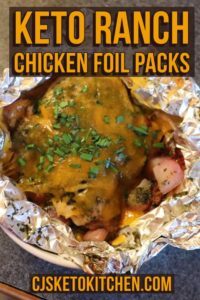 This versatile foil pack recipe can be taken a lot of ways, the only limited is your imagination. We use radishes to substitute for the higher carb potatoes and you honestly wont be able to tell the difference. Cook 5 slices of bacon or equivalent amount of bacon crumbles and in a skillet. Add your two bunches of radishes that you have cut into quarters. Let saute with bacon and in bacon grease for 5 minutes or so. The radishes will begin to soften and will take on the flavor of the bacon drippings. Add all of your seasonings (dill, tarragon, garlic...) into a bowl all of the seasonings together well. Once combined Add 2 tablespoons of your Ranch Powder to 6 tablespoons of melted butter. Mix and combine your seasoning blend into your melted butter. This is your Ranch Butter. Take one sheet of greased foil and place about 1/4 of your cooked radishes in the center of your foil sheet. Add 2 uncooked chicken thighs on top of your radishes, and season with more of your ranch powder if desired, and with salt and pepper to taste. 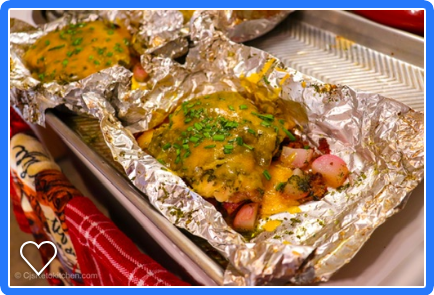 Fold aluminium foil to make a pouch ensuring that the edges are closed and tight. Repeat the above steps 4 times to make your additional packages. Place on a baking sheet, and place in a preheated 425 degree oven. Cook for 40 - 45 minutes. After 45 minutes remove packets from oven and open. There will probably be liquid/water from the radishes. You will need to carefully drain the water from each packet. Once the water is drained. Leave your chicken packets open and sprinkle cheese evenly over every packet. Place in oven for 5 - 10 minutes or until the cheese is melted. This is a new section that hopefully we can begin doing every week. This will be a section where we highlight older recipes from YouTube and here on the blog. 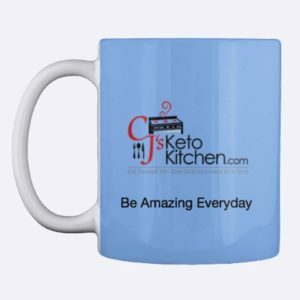 This weeks recipe is Keto Breakfast Skillet. Made this today, subsituted breast for thighs due to availability. Got a bit carried away with the ranch mix for seasoning, didn’t see where the salt & pepper came into the recipe, my reading skills can be sketchy lol. Didn’t have to drain anything. Next time I will, 1. brown bacon a bit more before adding radishes, patience, eh. 2. Less ranch mix. 3. Sear chicken momentarily before packaging stage. Have a great day, love your channel. Glad they turned out. Feel free to experiment. And thanks for writing.